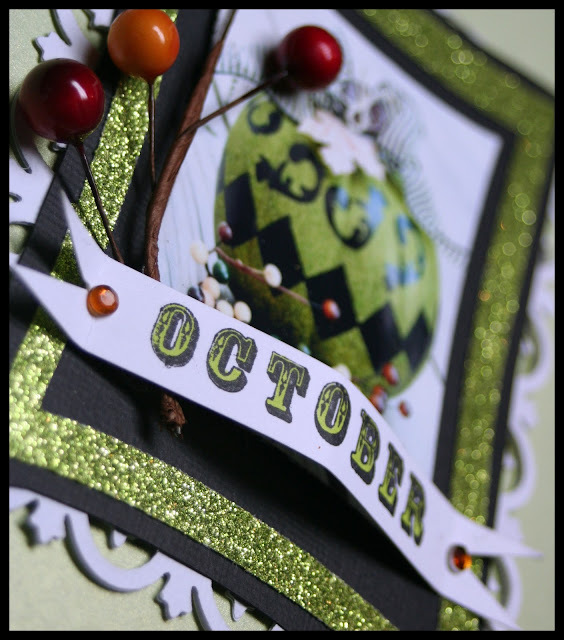 I have a fun post to share today including an opportunity to win Spellbinders die templates! First up is my daughter's glittered Pumpkin. On today's Spellbinders Blog post I show you how we created this pumpkin using Spellbinders die templates to cut out vinyl shapes to form a mask on the pumpkins. 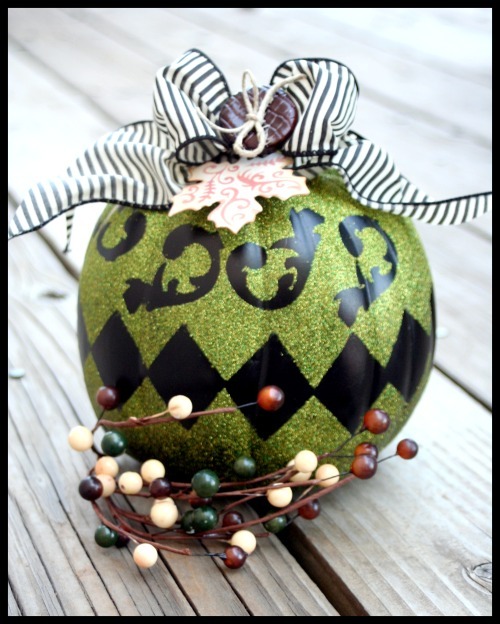 I spray painted the pumpkins with glitter spray paint and decorated them with embellishments. For your chance to win a set of Spellbinders die templates simply leave me a comment on the Spellbinders Blog post. Holly and Julie will also be hosting giveaways and together we will randomly select three winners who will each win a Spellbinders die template set - details on the Spellbinders blog! My daughters did such a wonderful job decorating their pumpkins and just like any proud mama I wanted to share their creations with the world! It dawned on me that I could print out images of their works of art and incorporate them on Halloween cards - yup this mama is pleased as punch as I go Double Duty on my Halloween Decor! Each letter and number image is a separate stamp! 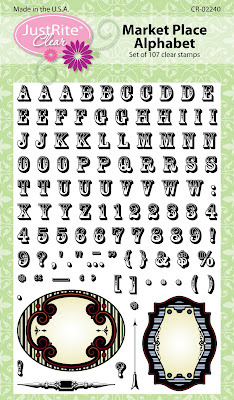 and there's more too.. this set consists of 107 clear stamps and they were designed to coordinate with Spellbinders Nestabilities Classic Ovals Lg, Classic Ovals Sm, and Labels Eighteen. JustRite Stampers is offering 30% off on Happy Halloween, Trick or Treat and Halloween Mini Sentiments. They are also announcing the blog candy winner on the JustRite Inspiration Blog. Whew now that's what I call a post! Good luck entering the giveaway. See you right back here soon. 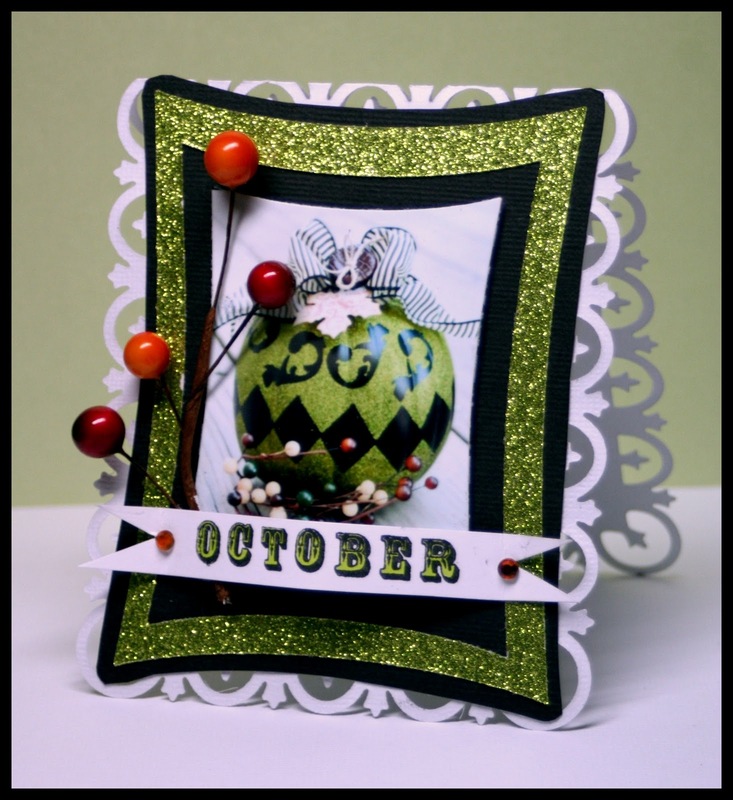 What a beautiful card and pumpkin! A great idea to make cards out of the picture..have to remember that one. Awesome card and pumpkin! I LOVE the font, what a fantastic set!! Very nice card, thank you for sharing it. This card is gorgeous! What did you use for the green sparkle on the card? It's such a great colour. Kazan...what great projects your daughters came up with...they are beautiful! Thank you for sharing their talents with us. As an affiliate from the military, your wages is just not showcased, therefore it's a breeze for you personally to receive fast approval for these refinancing options pay Day loans payday loan lenders online lend money to individuals without a credit check needed. be approved to your benefit automatically. Wow it's really nice...Beautiful cards. Excellent work you did. I have you bookmarked to check out new stuff you post. Keep sharing more.